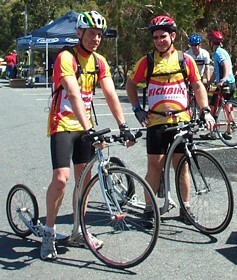 Bruce Cook and Alan Stewart (both of QLD) represented the Footbikes and Scooters on the day, both completing the 75km rides on Kickbikes. The different distances attracted a good variety of ages and cycles. Drink stations were located at the 30km and 46km points for the longer rides, and road signage and marshalls performed their tasks well. The terrain was hilly and roadworks stretching from Alexandra Hills to Capalaba caused delays for both cyclists and motor vehicles. The warm day was kept cool with strong winds buffering cyclists and a strong headwind around the beachfront of Victoria Point. Due to the extreme headwinds, roadworks, and a flat tyre, no records were set for Footbiking this day. Congratulations to both Bruce and Alan for completing the course, particularly when motivation is challenged when unforeseen obstacles arise.